This spider was observed at City Park, Nairobi, Kenya, October 2010. Roy Erling WrÃ¥nes kindly supplied the species name. An orb-weaver spider sitting patiently in the center of her web is a waiting target for a hungry, skilled bird to pluck out and eat. 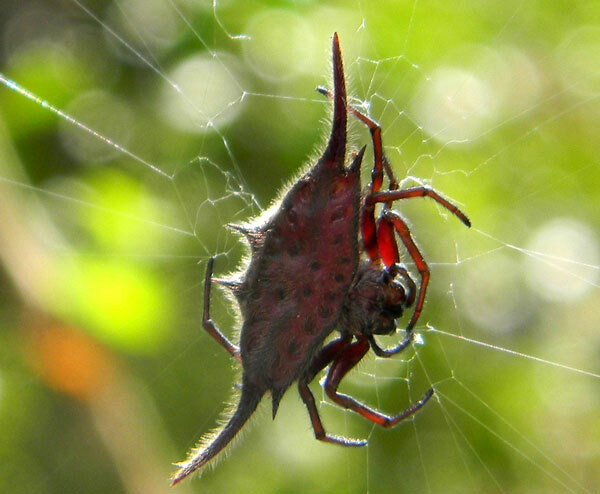 But Gasteracantha spiders have evolved sharp abdomenal spines that discourage such predation. Just in case the sharp-eyed predator forgets the spider, which is essentially blind, also shows bright warning coloration.